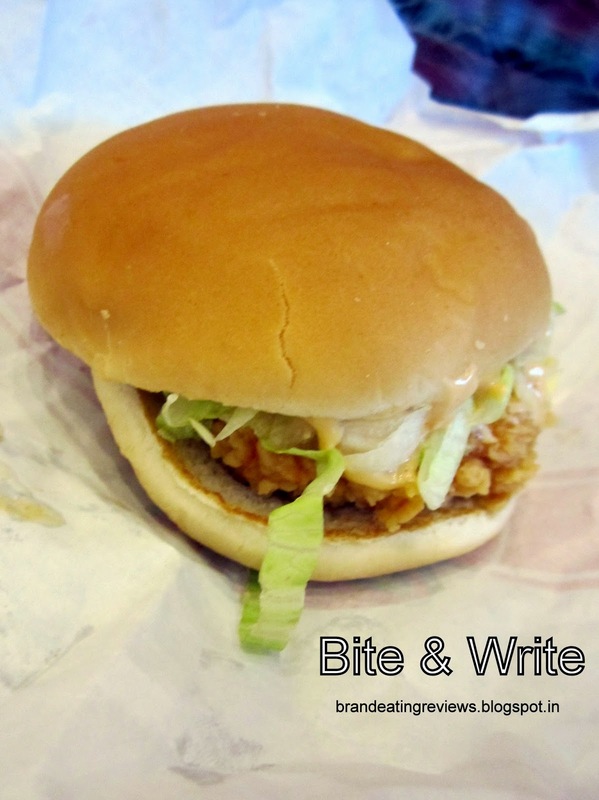 After KFC's Mango Burst review, it's time to tell you about the Chicken Rockin' Burger! Yay Burger!!! So, this was the second burger at KFC I recently tried after Chicken Zinger. 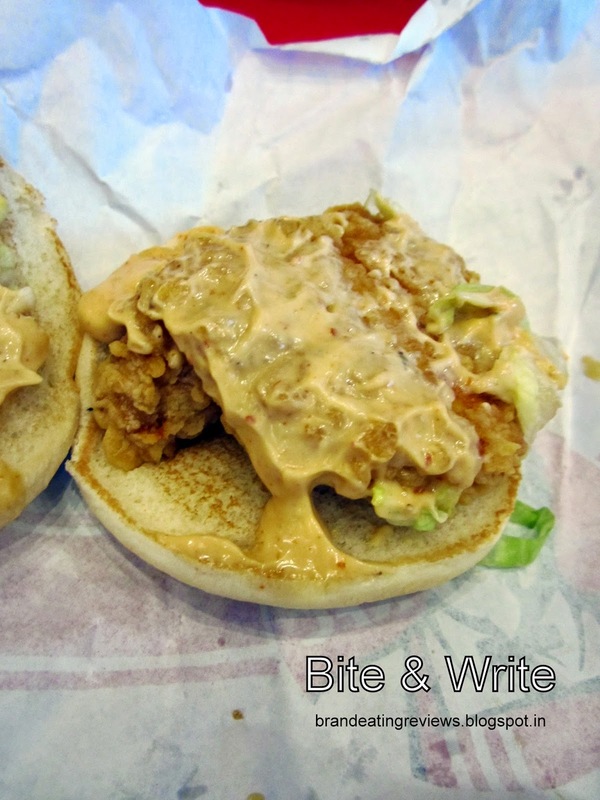 The description mentions that the Chicken Rockin' comprises of crispy chicken fillet, 3-pepper mayonnaise and iceberg lettuce packed between soft buns. Let's take a look at the pictures of my Chicken Rockin' burger. The burger came in the usual wrapping paper with Colonel Sanders' picture on it. The appearance of the burger was kind of off-putting. What I hate the most is the way they raise your expectations by showing you pretty pictures on the menu and then serve you something that doesn't look half as good. Let's move on to the tasting part now. The buns were slightly warm. There was ample mayo. But like you can see, there was not much lettuce that should have been there. Just a few sorry-looking shreds of soggy lettuce sticking out from one side of the burger. You lift the bun, boom! No lettuce! I had inquired at the counter about the patty while placing my order. The chicken fillet comes from the thigh of the chicken, which happens to have the juiciest and tastiest meat. The buns were the usual buns. They could have at least used sesame buns, considering the price tag of the burger. The chicken fillet was crispy on the outside and juicy on the inside. It was very comforting biting into the chicken fillet. It was the original recipe chicken and hence a bit bland, but the 3 pepper mayo compensated for the lack of flavors in the fillet. The burger was not very spicy, considering it had "3 pepper mayo". 3 pepper mayo is sounds spicy and is supposed to taste that way, isn't it? And only God knows whose idea it was to create a burger without the cheese! But I think it's a sales tactic of KFC to not add cheese to their default burger recipe. They straightaway ask the customers while taking the orders "Single Cheese or Double Cheese?" and then punch in some more numbers in the billing machine if you say yes, which is pretty often. If you had read my previous post on KFC's Mango Burst review, you would remember me saying that I am not a fan of KFC's burgers. Now here is the reason why is that so! The buns! They are so dense and doughy. As you chew on the burger, the bun sticks to your teeth and on the palate. You can feel it sticking in your throat as well, making it tough for you to swallow. You must have a drink by your side to wash (literally wash) that burger down! However, Chicken Rockin' buns were not as doughy and dense as those of Chicken Zinger's. So, thank God!! Let us take a look at the ratings now! So the question is, will I order Chicken Rockin' again? I don't think so! Agree 100%, I regret ordering this-its just a little improvement on the 40 rs burger.It was so disappointing especially after they advertise it as a mid range burger but it's really basic,less than basic even. I liked it. The chicken pieces were good. And the mayo was spicy.